Cameroon, like many African countries, is far from achieving the Millennium Development Goals by 2015. With only five years left until the deadline, no region in Cameroon is untouched by poverty - many cannot afford a decent meal; many cannot afford education, child and maternal mortality is unusually high, HIV/AIDS is on the rise, you name it. While it is true that it is the responsibility of the government to fight poverty, it is also true that many ordinary Cameroonians are positioned to effectively contribute, no matter how small, to ensure that poverty is eradicated in the West African country. Cameroon's favorite striker - Samuel Eto'o Fils, recently demonstrated his capability to help eradicate extreme poverty in his community. Earlier this week, Eto'o reportedly spent 1.3 million dollars on watches for his team mates in Cameroon's National Soccer team - the Indomitable Lions. Converted to the local currency of Cameroon, 1.3 million dollars amounts to about 706.3 million Francs CFA (the last time I checked). This is a lot of money - which if channeled to the right quarters and properly managed, would effectively lift a whole community from abject poverty, in a country where 51% of the population lives on less than 2 dollars a day. As you would expect, many have hailed Samuel Eto'o for this lavish spending. No doubt, the striker acted in good faith - probably to motivate his team mates, and in fulfillment of a promise - a promise made after the Indomitable Lions qualified for the South African 2010. Mindful of the adage that "a man of honor keeps his word", it is fair to say Eto'o is truly a man of honor. He has proven that he does not make a promise he cannot keep. However, you would agree that spending a staggering sum of $1.3 million on watches, while your community languishes in poverty, amounts to wasteful spending. This is misappropriation of much-needed funds - funds that could change thousands of lives in many poverty stricken regions in Cameroon. Why spend such a huge sum of money on luxury watches? Don't you think $1.3 million could enable Samuel Eto'o Foundation to impact more lives through more educational and health programs? Samuel Eto'o clearly has the resources to help eradicate extreme poverty and hunger in his community. Make no mistake - he is already doing a phenomenal job. Through the Samuel Eto'o Foundation, he has implemented a good number of social projects in Cameroon. But with a slight change in scale of preference, and a reduction of wasteful spending, Eto'o will be a force to reckon with in the fight against poverty and hunger in Cameroon. 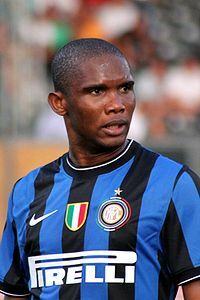 Eto'o currently plays for F.C Internationale Milano, and he is the highest goal scorer in the history of the African Cup of Nations - as of today. The causes of poverty in Cameroon cannot be fixed by channeling $1.3mil into the right channels. That would go to the surface for a moment. I believe it is OK for Eto'o to spend his money any way he chooses to ... and we ought to be excited and ask God to anoint and grant us that kind of favor so that we too can have that kind of $ & spend it any way we consider appropriate to effect change. B/c the fundamental law of attraction states that u can only attract that which you admire. If we 'blast' what he did, it stays away from us. Lema, I maintain that the causes of poverty can be fixed by channelling money down the right channels. You would agree that the wasted $1.3million could help educate many children who can't afford education, and enroll many in vocational programmes that would endow them with the needed skills to make a decent living. But I agree - it is OK for Eto'o to spend his money the way he deems appropriate. Afterall he has worked extremely hard to make a fortune. Njumbe, you're right - many Cameroonians cannot afford a decent meal. I'm glad you see what I see.